Gene Link specializes in the synthesis of RNA modified oligos, RNA fluorescent probes with quenchers, chimeric oligos containing various combinations of DNA, 2'O methyl bases and phosphorothioate linkages. Each oligo is run side by side on a polyacrylamide gel to visually assess quality. 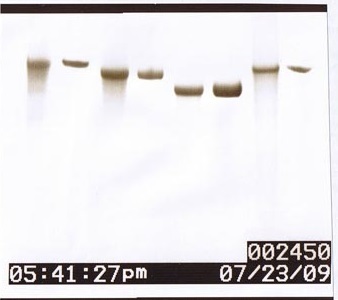 A real gel picture is included as part of the oligo report. Polyacrylamide gel electrophoresis of crude and gel purified RNA oligos in adjacent lanes. Lanes 1 & 2: 89 mer; lanes 3 & 4: 84 mer; lanes 5 & 6: 68 mer; lanes 7 & 8: 83 mer. At Gene Link we recommend gel purification of all RNA oligos longer than 30mer. Gel purification is the “gold standard” method of purification as the denaturing polyacrylamide gel resolution approaches single base and the major band is clearly visible to be purified. depending on oligo sequence and structure. Gel purification recommended to achieve purity above 95%. Not recommended for RNA oligos longer than 35 mer. **RPC is reverse phase purification using a cartridge; a substitue for HPLC. Yield will gradually decrease as length of oligo increases. Palindromes, hairpins and high GC content oligos and oligos containing stretches of 3 or more G's induce strong secondary structure and base stacking thus decreasing purity and yield. *a. Typical yield stated in the table is for unmodified random sequence oligos. Reduction in yield is observed with high GC content oligos and those forming strong secondary structures. b. Reduced yield is expected with modified oligos. The reduction percentage varies with modification type and number of sites. Typical reduction is 10%-20% per modified site.